– Les Plantes, covering approximately 0.56 hectares (1.4 acres) and planted in 1968-69 is classified as Premier Cru although we have decided to use it only as « village » classification. – La Combe d’Orveau, covering approximately 0.77 hectares (1.9 acres) was planted over several periods from 1952 to 1998. Annual production varies between 3000 and 7000 bottles approx. This wine is recognisable by its intense bouquet which is simultaneously fruity, floral and very delicate. To complement the aromas, the wine has a supple structure that is always light and fine; the finish is long and blossoming on the palate. 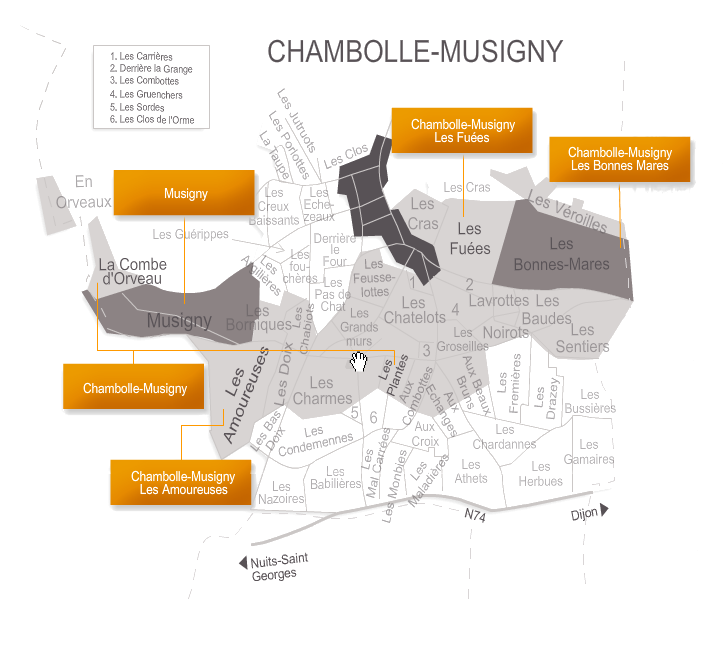 Key words to describe our Chambolle Musigny include subtlety, delicacy, but equally charm, joy, brilliance. Some vintages may be enjoyed in their youth although all years will age at least ten years.